Usain Bolt completed another stunning Olympic sprint double by winning the 200m as Jade Jones took Britain’s gold tally to 22 with taekwondo success. Jamaican Bolt, competing in his last Games, won in a time of 19.78 seconds, can make it nine golds with victory in Friday’s 4x100m relay final. Jones, meanwhile, beat Eva Calvo Gomez to win taekwondo’s -57kg division. With three days of action left in Rio, Britain are nine medals short of the record 65 they secured at London 2012. GB got off to a great start on day 13 after failing to win a medal on day 12. Alistair Brownlee and brother Jonny won gold and silver respectively in the triathlon, with Hannah Mills and Saskia Clark triumphing in the sailing. Liam Heath and Jon Schofield added a silver in the men’s 200m kayak double, while Marcus Ellis and Chris Langridge took a surprise bronze in badminton’s men’s doubles. 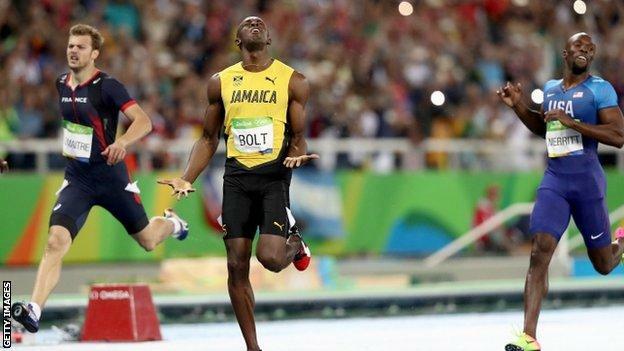 Bolt, who won the 100m title on day 10 of the Games in Brazil, once again dominated a 200m Olympic final. He has now won the Olympic sprint double three times, having repeated his exploits in 2008 and 2012. Silver went to Canada’s Andre de Grasse, who clocked 20.02, while France’s Christophe Lemaitre won bronze in 20.12, edging out Briton Adam Gemili, who was fourth, just 0.003 behind. Bolt, who celebrates his 30th birthday on Sunday, was unhappy with his winning time and added it was unlikely he would compete in the event at the World Championships in London next year. 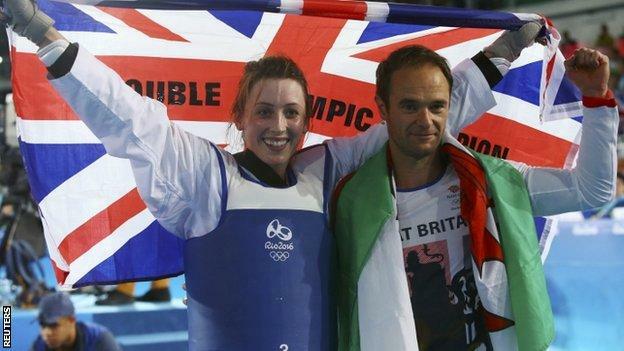 Welsh fighter Jones demonstrated her superior taekwondo skills to beat Spaniard Calvo Gomez 16-7.